Ah, what do they want? Lined up, waiting to visit. 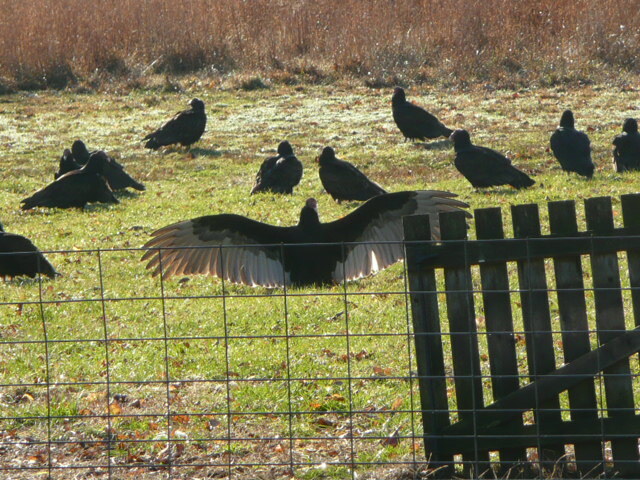 Each fall, we are visited by a flock of vultures. I’m not sure specifically what bird this is, but since it looks like a vulture and acts like a vulture, we call them vultures. Our barn is covered with them in the morning, and I know our house roof is, as well, because they look in the sky lights in our bathroom, perch on the chimney and talk down it, and generally make a nuisance of themselves. 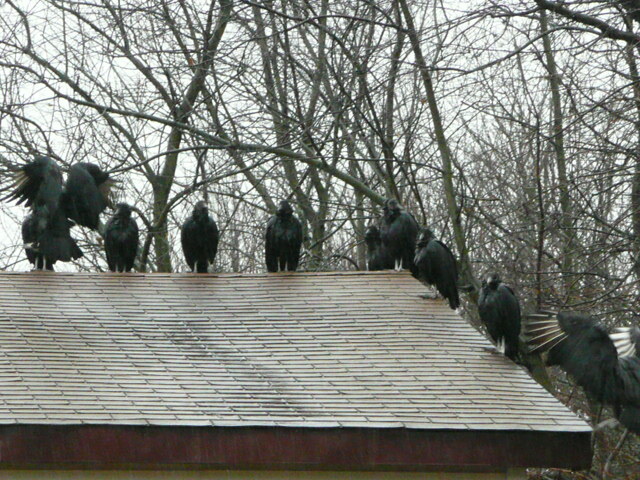 I wonder what passerby think when they see a house and yard covered with vultures? Do they think someone is dead in the house? We think they like the sheep. ( Or, the sheep deposits, which we see them eating….) Once, last year, I saw one of my sheep with one of these huge birds perched on her back, with its wing over its head. It was creepy looking. 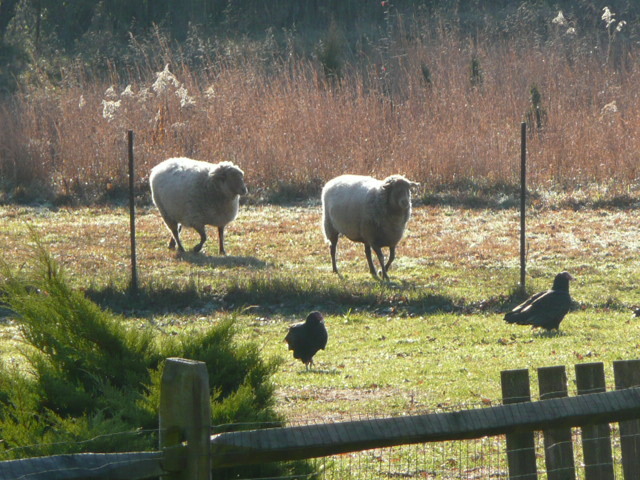 Last week, as the sheep were sleeping on the ground, the birds started taunting them, picking at their wool and annoying them. I’m not sure what all of this means, if it is an omen, or a sign, or just disgusting. 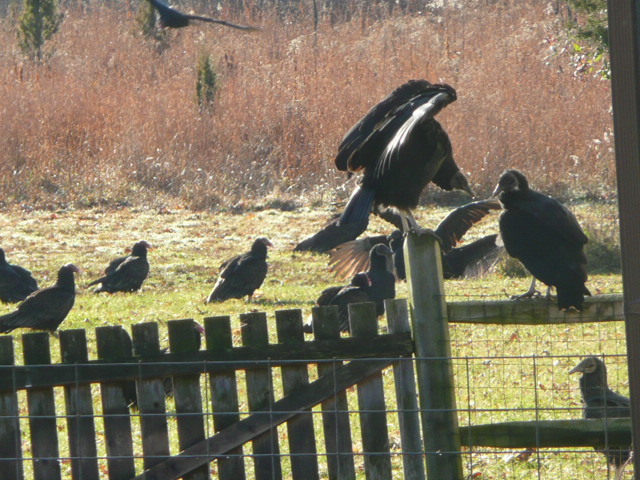 For whatever it’s worth, they are turkey vultures – not the prettiest of raptors, but they are carrion eaters, so you shouldn’t have to worry about the sheep!! They are related to eagles, hawks, falcons, and probably condors. I’ve seen them near Conti’s farm in Tabernacle – it’s a little weird to be cyling past a group of them -makes you feel like they’re just waiting for you to fall off!